Alfred A. Knopf, New York, 2009. 36 pages. This picture book biography tells the story of Jacques Cousteau's amazing life with simple details and evocative pictures. Looking at the pictures brought me right back to the days when my family used to watch the TV show, The Undersea World of Jacques Cousteau. 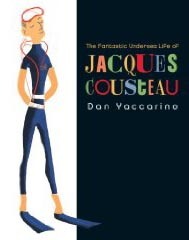 Every page includes an inspiring or illustrative quotation from Jacques Cousteau. Jacques Cousteau began his fascination with the sea as a sickly child, encouraged to swim to build up his strength. He was also a scientist, tinkering with cameras from a young age. Those two passions combined encouraged him to expand the technology available for ocean exploration, and to share what he discovered with the world. This beautiful biography will fascinate children with the sea and what one man can do to expand knowledge for everyone.